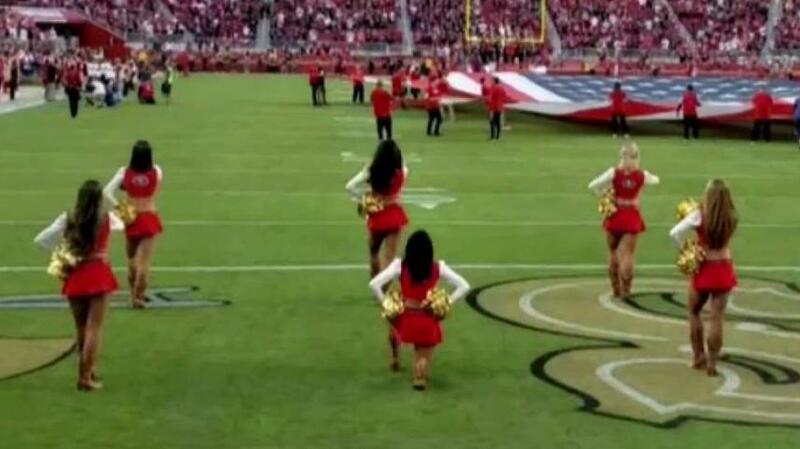 A San Francisco 49ers cheerleader was spotted kneeling during the national anthem at Thursday's game against the Oakland Raiders. Damian Trujillo reports. A San Francisco 49ers cheerleader was spotted kneeling during the national anthem at Thursday's game against the Oakland Raiders. The nationally televised game was held at Levi's Stadium in Santa Clara. Former 49ers quarterback Colin Kaepernick began a wave of protests by National Football League players two seasons ago, kneeling during the anthem to protest police brutality and racial inequality. The 49ers did not offer a comment but will be holding a press conference Friday afternoon. Kaepernick seems to have paid a heavy price for his protest, NBC Sports reported. He hasn't played in the league since 2016, and he reportedly has no prospects of joining a team anytime soon.